Comprehensive review of St. Tropez Self Tan Sensitive Bronzing Mousse. See what real experts and actual users have to say about this self tanning product. So, I didn’t really like this product so I gave it 2 out of 5 stars. I like the idea of it being formulated for sensitive skin, but they claim it produces the same tan as the regular formula, which it definitely doesn’t. Coming out of the bottle, the mousse is a cream color, so it doesn’t have a guide. The mouse is a nice texture which makes it easy to apply. But it stinks! It smells like household cleaner mixed with DHA…..the smell made me a little sick. I was also really let down by the color it produces. I woke up with a really light, orange tan. I had expected to be golden brown like I am with their regular mousse, but no way Jose….I was orange! Application was easy and clean, which I liked. But overall this mousse let me down. 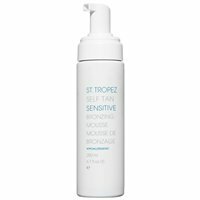 St. Tropez Self Tan Sensitive Bronzing Mousse comes out with a lighter guide than their original formula. There is almost no guide; it’s more of a light cream color. And it definitely doesn’t act as a guide once you apply it to your skin. The mousse is light and airy which makes it nice to apply. Applying this mousse is easier than others, due to the lack of color guide. But you do need to be extra careful to make sure you don’t miss any spots. That’s why I still used a tanning mitt, to ensure even application. You don’t need to worry about this mousse staining anything or getting all over your bathroom. Overall, this mousse dried in about 20 minutes. As it dried I didn’t feel wet or sticky, and I didn’t have to worry about the guide staining anything, which was nice. 20 minutes is pretty average, so I was happy with the drying time. St. Tropez Self Tan Sensitive Bronzing Mousse smells like household cleaner mixed with DHA. I really wasn’t a fan of the smell. It smelled fresh, but it smelled way too much like chemical and the smell started to make me sick. I also could smell some DHA in there, which obviously smells gross. As the tan developed the smell stuck around, the chemical smell actually got a bit stronger. The next morning I could still smell some DHA, yuck. This is where I was let down by this product. I was expecting a nice, deep tan like the original formula produces. Well, that’s definitely not what I got. I woke up with a light, orangey tan. I was upset the tan had an orange tint to it, and that it was so light! You’d need to apply this at least a few more times for a noticeable self tan. I’m a huge fan of the original St. Tropez Mousse, and this one just looks a lot faker. It also became pretty scaly looking at it faded. No, I think men should stick with the original formula (unless they can’t due to sensitive skin). This one product a fake orange color that was super light. This mousse works out to $6.27 per ounce, which isn’t too bad. It’s a bit higher than average, but nothing crazy. But in my opinion it’s not worth it. To buy St. Tropez Self Tan Sensitive Bronzing Mousse, Click Here. Look and Feel This is a fluffy mousse with no guide; it’s a light cream color. Application Applying it is pretty easy; just make sure you cover all areas. Drying Time It dried in 20 minutes, which is average. Smell (Before) Smells like household cleaner and DHA mixed together. Smell (After) I could still smell DHA as it developed and in the morning. Color Produced I got a light, orange tan. It wasn’t too pretty. How Long It Lasts It lasted about 2-3 days before becoming scaly and fading. OK For Men? Nope, I think there are better options out there for men. Price It’s $6.27 per oz….that’s just a tad above average.